Giacomo “Socke” Thüs is a StarCraft 2 and former Brood War player from Germany. He played as Protoss in Brood War and in the StarCraft 2 Beta. Socke is currently a member of the e-sports team Alternate. Socke was one of the players representing Germany’s SC:BW team in WCG 2002 in Korea. Socke is a member of Germany’s national team – Team Germany. Despite only winning one event during the beta, Socke gained prominence due to his consistent high placings in the Go4SC2 cups. His count of 1 first, 4 second and 2 third place performances starting from the very first cup made players start to take notice. He made it to the final game in ZOTAC Cup #15 before losing to Swedish Terran MorroW. On top of his impressive online performance, Socke also traveled to the USA to play at the MLG Raleigh tournament in Raleigh, North Carolina. He got knocked down into the Lower bracket by Drewbie in the third round, but stormed through the second bracket to make the lower bracket finals where he faced off against KiWiKaKi. He ended up losing the match 2-0, but placed 3rd in the event and traveled home with his $1000 prize. Socke’s most notable victory in 2010 was his gold medal at ESL Pro Series Germany. After coming in fourth place in the group stages, Socke went through the live event bracket, eventually defeating Cloud in the grand final. Socke then made his way through the IEM Season V – European Championships and qualified for the Finals event in Kiev, Ukraine. Socke went through his group in third place but was knocked out in 5th/6th place by Tarson, just shy of qualifying for the world finals. 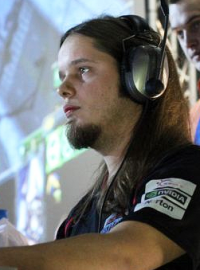 He also participated in Assembly Winter 2011, knocking out both HuK and Tyler, but losing against MorroW in the semifinal and placing in fourth place after losing to Adelscott despite a 2-0 lead in the third place play-off. Socke continued his ESL Pro Series success in 2011 by taking down HasuObs 3-1 in the EPS’ Season 18 Finals. At Gamescom 2011 in Cologne, Socke qualified for WCG 2011 in Busan by finishing 2nd in the German WCG qualifier. He also reached a 4th place finish at the IEM Global Challenge. Socke was initially supposed to participate in MLG Orlando but unfortunately could not make it, therefore being replaced by the next highest seed.